The New York Times released body camera footage on Friday that shows police in Coweta County, Ga., handcuff and Tase Chase Sherman in November, 2011. Sherman died at the scene of the incident. Sherman was in the car with his parents and fiancé when he began acting erratically. His mother, Mary Ann Sherman, called 911 and told the operator, "He's going to kill us all if we don't get help." She later revealed that her son had smoked "Spice," a kind of synthetic marijuana. Two patrol cars arrived on the scene shortly after. The Sherman family told CNN, "deputies didn't ask what the problem was or try to de-escalate the situation. Rather, they climbed into the backseat where Chase was buckled, handcuffed him, and threatened to shoot him before deploying their Tasers several times." Taser logs show the officers used their stun guns on Sherman a total of 15 times. The intense video shows Sherman yelling "I quit, I quit." 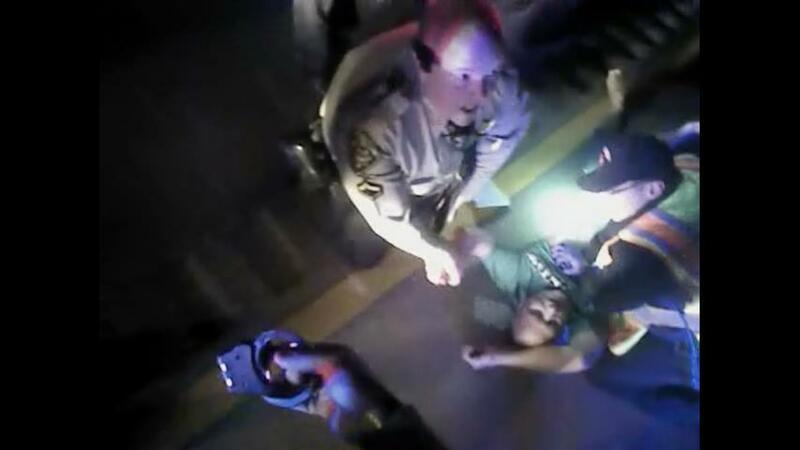 It also shows the officers' panicked reaction when they realize he had stopped breathing. The Sherman family's lawyer told the Times, "For four minutes and 10 seconds after he said 'I quit,' they still Tased him and kept him on the ground," he added. "That's torture, and they killed him." The release of the video comes amid a growing call for more law enforcement officers to wear body cameras. Two recent police-involved shootings -- of Walter Scott and Levar Jones -- in South Carolina resonated across the country in particular because video contradicted police accounts. Some have used these as justification for officers to wear body cameras at all times. They have been found to decrease violence against police -- if the officers use them properly. A recent study of police in the U.S. and U.K. found if officers switched their cameras on and off during their shift, the odds of them using physical forced increased -- but if they kept them rolling, the rates of violence against them decreased.